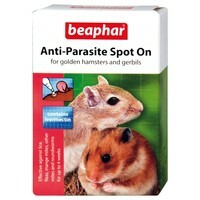 Beaphar Anti-Parasite Spot On for Hamsters & Gerbils is an extremely effective external parasite treatment for hamsters, gerbils and mice. Highly effective in controlling external parasites, such as mites, lice, fleas, tick, as well as internal parasites such as roundworms, this veterinary approved product contains Ivermectin in ready to use pipettes, for a quick and easy treatment process. Suitable only for use on the small breeds of small animals that are over 50g.